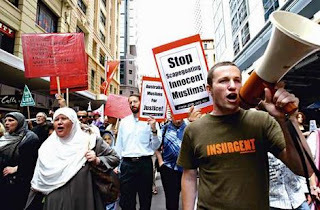 Under the provisions, jail terms could be imposed on people seen to oppose violence, protest illegal and degrading wars, or incite ill will against Australia's involvement in criminal activities like the war on Iraq, where over 100,000 innocent men, women and children were killed, maimed or tortured. An estimated 2000 protesters took to Sydney's streets yesterday to express their concerns about the anti-liberty laws. Similar rallies were held in capital cities across the country as civil rights groups and Islamic leaders gathered to protest against the legislation. The whole anti-liberty package should be dumped as another HoWARd crime against humanity. The anti-terrorism legislation, which will give police and intelligence authorities unprecedented powers, was introduced into Parliament last week. There is widespread unease among Government backbenchers and civil libertarians. These orders will be imposed for no crime, control people and prevent people from speaking out or participating in their normal day-to-day activities. The backbench committee and Attorney-General were at loggerheads over issues of no principle in the laws. The state premiers ought to be ashamed of themselves for not standing up for their communities in that these laws would breach any general standards and common law principals. NSW Premier Morris Iema is well aware that at present his government is being sued over the Community Protection Act 1994, a law that also imposed preventive detention so he knows that legislation proposed by the hoWARd government is already 'invalid'. When hoWARd played his terror card last week the only way he could continue to validate the serious alarm and affront he imposed on the nation was to have frontline intelligence officers and pro-government media giants prop up to argue that the government had breached the security act. But this was only to help cover up hoWARd's lie. Then low and behold a former Australian Security Intelligence Service agent Warren Reed said state-based police and intelligence officers involved in covert surveillance of suspected terrorists feared their targets would now go underground. Reed played right into hoWARd's hands 'or the other way around more like it' appearing to validate the notion that Australia had faced a 'real threat' when hoWARd announce the fear. But this was just more propaganda and their fears that the 'targets' would now go underground was like 'phantom of the opera', but in a long, long list of lies this was just another blatant lie by the hoWARd dictatorship because no one is able to get to the truth, because it's another secret. The propaganda message from inside the intelligence system, especially on the front line at the state level, is that hoWARd's terror scare had some validity. Shame hoWARd shame on you!